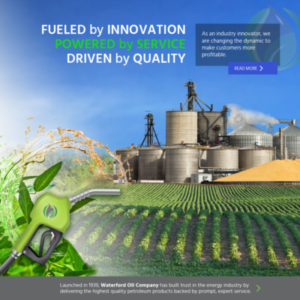 Waterford Oil, a petroleum industry leader established in 1939, came to Imbue with the need for a new logo and fresh face for their brand. The goal was to better communicate their dedication to both tradition and innovation, their eco-conscious methods, and concern with serving America in making businesses more profitable. With that, Imbue set out by redesigning their logo. The fresh font and assorted green hues brought new life to a traditional brand image, while also reflecting their commitment to renewable energy. Then Imbue designed a business system for Waterford Oil’s employees, including letterhead and business cards. After the new image and business collateral was established, Imbue designed, developed, and provided all of the copywriting for their new website. This modern, mobile, responsive website design brings full circle their new brand image and reflects their forward-thinking attitude.